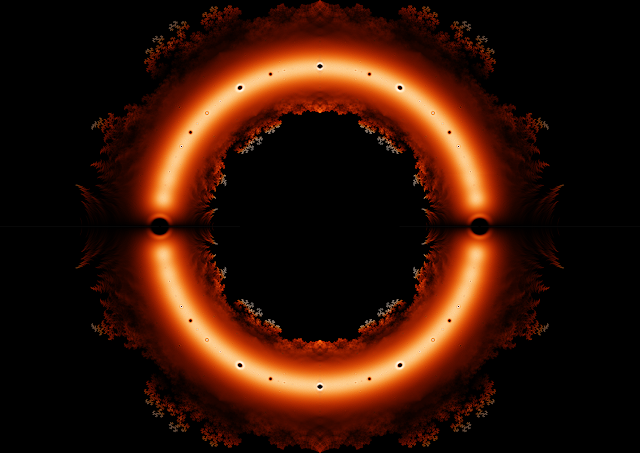 On the subject of mathematical beauty, something I've mentioned before (eg. here and here), I couldn't resist pointing to this post about roots of polynomials from John Baez's blog...fascinating stuff. The basic idea: if you plot the complex roots of degree-24 polynomials, with coefficients 1 or -1, in the complex plane, you get the beautiful pattern below. Complexity emerges from simplicity, or if you prefer, within complexity, simplicity is hidden. Beautiful. I love the concept.